Senate Democrats have decried support from "dark money" groups for President Donald Trump's Supreme Court nominee Brett Kavanaugh, but they have been silent on their own coordination with a group that promised to spend at least $5 million against his nomination. As the Senate Judiciary Committee's scheduled vote on Kavanaugh nears, advocacy group Demand Justice has increased pressure on Senate Democrats to announce their opposition to the nominee. The group hopes their stated opposition will serve to pressure Republican Sens. Lisa Murkowski (Alaska) and Susan Collins (Maine) to join them. Brian Fallon, the former senior adviser of the Super PAC Priorities USA, became the executive director of Demand Justice earlier this spring to fight Trump's "takeover" of federal courts. He originally pitched the idea for the group in April, months before Trump nominated Kavanaugh, during the spring conference of the Democracy Alliance, a wealthy liberal donor network that funnels millions of dollars into approved political groups. Weeks before Justice Anthony M. Kennedy announced plans to retire, Demand Justice launched a "Ditch the List" website and digital ad campaign targeting Trump's potential Supreme Court nominees. The campaign directly targeted a list Trump previously compiled of potential nominees, one that included Kavanaugh. In June, less than 24 hours after Kennedy announced he would retire in July, Demand Justice hosted a rally with several Senate Democrats on the stairs of the Supreme Court with "Ditch the List" signs. Some of the rally speakers included Democratic Sens. Kirsten Gillibrand (N.Y.), Cory Booker (N.J.), Kamala Harris (Calif.), Elizabeth Warren (Mass. ), Ed Markey (Mass. ), Richard Blumenthal (Conn.), and Chris Murphy (Conn.). Several of the same Democratic senators would rally about two weeks later for an event hosted by the Center for American Progress, Demand Justice, and several other liberal organizations. The rally occurred in the immediate aftermath of Trump's official nomination announcement of Kavanaugh. The CAP press release for the rally was sent out the day before Trump's announcement and encouraged Americans to "reject the nominee." The participating Senate Democrats have been outspoken critics of dark money in politics, and many have spoken out against conservative groups involved in the campaign to confirm Kavanaugh. 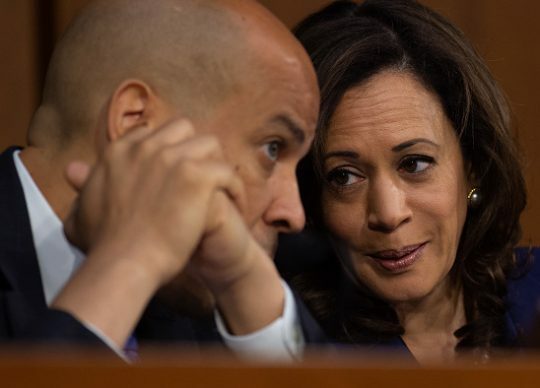 However, Democrats have simultaneously coordinated with Demand Justice, an organization that is "arguably even more opaque than the nonprofits against which it competes," according to the Washington Post editorial board. Demand Justice has an "additional layer of secrecy" that makes it difficult to determine who the donors are, the Huffington Post noted. Booker, who attended at least two Demand Justice rallies on June 6 and June 28, posted on Facebook that he believes dark money has "corrupted our democracy." He also echoed Demand Justice on the night of Trump's Supreme Court nomination announcement to say he would do everything he could to stop Kavanaugh's nomination, saying he would not "side with corporations" and get dark money out of politics. Harris attended the same two Demand Justice rallies as Booker, despite saying in 2016 that dark money "pollute[s] our politics." Warren and Gillibrand, who both attended the "Ditch the List" rally and spoke during Demand Justice's "Rise Up For Roe" tour, have railed against the Judicial Crisis Network and other conservative groups for spending millions of dollars in support of Kavanaugh. Warren said last month that "powerful corporate interests have poured gigantic amounts of money into capturing our courts" and that the Senate needs to stop Kavanaugh so "Washington starts working for the people again." Gillibrand echoed the idea, saying "we need to end the influence of dark money in politics." While it does not appear Sen. Sheldon Whitehouse (D., R.I) was present at the previously mentioned rallies, he has been an outspoken critic of dark money in politics and has not called out Demand Justice or his Democratic colleagues for coordinating with the group. In contrast, he said last month that he thinks a "smelly special interest network" of dark money was involved in helping Kavanaugh's nomination process. He did not expand on how he reached his conclusion but said there should be a "spotlight" put on the dark money network. He did not say anything about the role of Demand Justice or other left-of-center groups. "A multi-million dollar advertising campaign supporting a Supreme Court nominee further exacerbates the perception that corporate special interests have captured this Supreme Court," Whitehouse wrote to the Judicial Crisis Network last month. "Corporations or ultra-wealthy individuals with millions of dollars to spend in secret on a Supreme Court nomination presumably invest their money wisely and expect to see a handsome return on that investment. Here, that means a justice who will reliably vote in favor of their narrow interests, and not fairly consider the interests of all Americans." Demand Justice is not a standalone organization but rather a "project" of the Sixteen Thirty Fund, a D.C.-based 501(c)(4) "fiscal sponsor" organization. Fallon, who previously served as Hillary Clinton's press secretary during the 2016 presidential campaign, told CNN last month, "If (Kavanaugh) gets confirmed for the Supreme Court, he will be a reliable vote for special interests," despite his group's strong ties to liberal special interests. The fiscal sponsor arrangement between Demand Justice and the Sixteen Thirty Fund makes it practically impossible to trace the source of funds that make its way to Demand Justice. Under this "pass through" arrangement, donors who give to Demand Justice do not have to report the money as going directly to the group and instead mark it as going to the Sixteen Thirty Fund. Organizations that are "fiscally sponsored" also do not have to file tax returns to the IRS due to the sponsorship arrangement, which provides an even greater layer of opacity for the groups. Eric Kessler, the president of the Sixteen Thirty Fund, is a former Bill Clinton appointee and a member of the Clinton Global Initiative. Douglass Hattaway, the director of the Sixteen Thirty Fund, worked "closely" in the past with Hillary Clinton. Kessler also founded the New Venture Fund, a 501(c)(3) "fiscal sponsor" organization. In addition to the Sixteen Thirty Fund and New Venture Fund, Kessler is the founder and senior managing director of Arabella Advisors LLC, a social venture firm that provides consulting to liberal philanthropic endeavors. Scott Nielson, the managing director of advocacy at Arabella, has worked for the Open Society Foundations, liberal billionaire George Soros's group, and the Democracy Alliance, the left's largest secretive liberal dark money donor network that was co-founded by Soros. The Sixteen Thirty Fund has also disbursed hundreds of thousands for "consulting" purposes to the Democracy Alliance, its tax forms show. The Washington Free Beacon reached out to the offices of the Democratic senators, but they did not respond to requests for comment. This entry was posted in Politics and tagged Brett Kavanaugh, Chris Murphy, Cory Booker, Ed Markey, Elizabeth Warren, Kamala Harris, Kirsten Gillibrand, Richard Blumenthal, Senate Democrats. Bookmark the permalink.